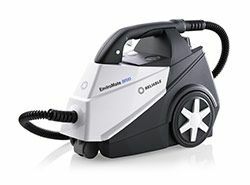 Reliable Corp’s EnviroMate line of steamers have been around for a few years, and have been very well received. EnviroMates are a popular choice for both residential and commercial steaming needs, thanks to their high quality and feature set for the price. Every EnviroMate steamer carries a lifetime warranty on the boiler tank, making them a great choice for a long-lasting steaming solution. In the past, shoppers considering the EnviroMate product line had to choose between products with very different feature sets (and prices): the small, handheld Pronto P7, or the powerful full-sized E3. Given that the prices range from $99 to $499, this was a tough decision to make, and many customers were left wishing something in between the two was available. Thankfully, Reliable was listening, and has just released the all-new EnviroMate Brio EB-250 to fill the gap. The Brio is meant to be the perfect balancing act when designing a bed bug steamer. It is small, compact, and lightweight, yet packs the punch needed to get the job done. The Brio also manages to squeeze in premium features like adjustable steam pressure and solenoid control, all for the mid-range price of $299. Is the Brio the best of both worlds, or is it little more than a bundle of compromises? Let’s find out. The Brio is beautifully designed, and its build quality is great for the price. From the moment I unboxed the Brio, I was infatuated with its unique design. When stripped of attachments, the spray gun fits into a port on top of the body and doubles as a carrying handle. Brilliant. The concept makes for a noticeably more portable steamer – no more carrying the body with one hand and the gun in the other. The three-wheeled design does a great job at allowing the steamer to glide across smooth floors when you want it to, and stay put when you don’t. The three wheels kept the steamer mobile but controllable. The Brio weighs a mere 10.5 pounds on an empty stomach – when filled to the brim, it tips the scales at about 12 pounds. Instead of going with the usual boxy or cylindrical design, Reliable opted for a long but slim body, measuring 17″ long and only 7″ wide. This makes it very easy to stash the Brio away in a closet when you’re not steaming. The Brio comes with an arsenal of accessories. There’s a little something for every chore when you dig into the Brio’s included gadgets and gizmos. Extensions, nylon brushes, brass brushes, angled nozzles, fabric and window heads, and more are all shipped with the Brio. Everything appeared solidly made, and installing your attachments of choice is simple – just insert and twist to lock it in place. The floor steamer is large and well-made, and is able to swivel for easy maneuvering. For today’s testing, I opted for the large floor attachment mounted on a single extension tube. This isn’t the ideal bed bug steamer solution (that would be the small fabric steamer with the cloth wrapping), but it provides a good demonstration of the Brio’s steam power and general cleaning ability. Filling the tank might be a simple task, but it won’t always be a dry one. The Brio’s tank is double-walled aluminum, making it very durable. Filling it is as simple as unscrewing the cap and pouring water in. However, the port is a bit on the small side, and I managed to spill some water as I was filling the tank. Once it’s full, you can start the boiler with a push of a button. The controls are idiot-proof. Everything you need, nothing you don’t. It took about 15 minutes for the Brio to heat up, which is on par with other steamers of this size. After a short wait (about 15 minutes), the water was boiling and I was ready for action. One thing that irked me was how dim the indicator lights are: it might have been due to how brightly lit my review studio was, but I had to cup a hand over the controls to make sure the lights were actually on. The indicator lights tell me when I’m ready to start steaming. I just wish they were a bit brighter. Thanks to the solenoid steam activation, steam was contained near the boiler and sent on-demand to the gun. This avoids build-up in the hose between trigger pulls, ensuring consistently hot and dry steam. One feature I was happy to see is the trigger lock. Engaging the switch while pulling the trigger locks it in place, acting as sort of a cruise control for those longer steam jobs. This is an essential feature for any steamers that a property manager or pest control professional would consider, and is a welcome addition to this consumer-priced model. The controls on the gun are simple: pull the trigger to steam, and use the switch to lock the trigger in place. After I pulled the trigger, it only took about 2.5 seconds for steam to start pouring out. On high pressure settings, the Brio is a beast – this is more than enough power to ensure deep penetration into walls, floorboards, and upholstered furniture. When you’re aiming for contact kills on surfaces, turn the steam adjustment knob down to avoid blowing bed bugs all over the place. The Brio provides a consistently hot and dry steam, thanks to its high PSI and solenoid control. The Brio is a really well-made bed bug steamer, with more than enough muscle and features for its price range. It’s really an understatement to say we liked the EnviroMate Brio. It’s compact, lightweight, and packs a seriously deadly punch. Minor nitpicks aside, this is a very polished, well-made machine, that we are happy to recommend to residential and commercial buyers alike. It goes toe-to-toe with the Vapamore Primo, a steamer of the same price and the same weight. While the Vapamore has slightly more capacity, it lacks the 245-degree tip temperature of the Brio. It’s a toss-up as to which we like more – it will ultimately come down to buyer’s choice, and that’s a beautiful thing. The EnviroMate BRIO is easy to use, compact and lightweight. It offers a user-friendly steam cleaning experience at a price that makes steam cleaning attainable to a wider array of users.